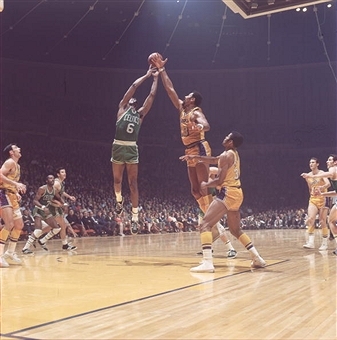 Today, May 5th is the 48th anniversary of legendary Boston Celtics big man Bill Russell's 11th and final championship, which came at the expense of the Los Angeles Lakers, who lost the series four games to three under the stewardship of Elgin Baylor, Wilt Chamberlain and Jerry West. Russell retired afterwards, having won eleven titles in just 13 years - an accomplishment never since matched in professional sports to this day. For more on that series, click here. Today is also the 23rd anniversary of the last game at the old Boston Garden, which took place in the first-round series between the Dino Radja, Rick Fox, Dana Barros, and Dee Brown-led Celts and the Orlando Magic, led by future Celtic Shaquille O'Neal, whose squad beat Boston 95-92 in what would be the club's last appearance in the playoffs until Paul Pierce and Antoine Walker carried the club back into the post-season seven years later.